A long list of sushi and sashimi, along with signature dishes that are not to be missed. Open Sun.-Thurs. 11:30 a.m.-10 p.m., Fri.-Sat. 11:30 a.m.-11 p.m.
About the restaurant: If we cut to the chase, Blue Ribbon’s story starts in New York in 1992. If we don’t, it begins long before that in France --- in the South, to be precise --- where Bruce and Eric Bromberg’s father would take the family on vacation every year from New York. Over time, the brothers (now chefs and restaurateurs) became fluent in the language of Molière. They learned to appreciate French cuisine and later went to Le Cordon Bleu in Paris to study all its intricacies. Back in the Big Apple, they opened their first restaurant, Blue Ribbon Brasserie, famous for serving (eclectic) food until 4 a.m. A few years later, a few doors down, a space became available and they turned it into a seafood market. But they are chefs after all, and soon after they got the urge to add a few tables and thus Blue Ribbon Sushi Bar & Grill was born. The Los Angeles spin-off is located at The Grove, one of the most successful shopping centers in the country. Located to the left of the Pacific Theatres, it’s not hard to spot with its patio and tall façade bearing shiny, dark tiles. There’s also a back entrance on Third Street with valet parking that allows you to avoid the (annoying) parking structure. On top of it, the private alley leading to the restaurant has been decorated with custom artwork from renowned street artist Sush Machida. Food & Drinks: Moving on to the food, select from a plethora of sushi and sashimi listed under two sections, “Taiheiyo” and “Taiseiyo,” according to the Pacific or Atlantic provenance of the fresh fish. If you opt for a platter, you will probably get your camera to take a picture of it before you start manipulating your chopsticks. Save room for the restaurant’s signature cooked dishes, or plan for a return visit as there are so many and it is always difficult to choose. 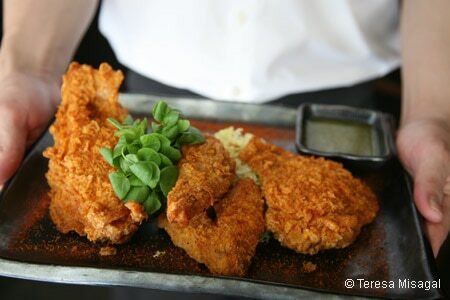 The fried chicken with wasabi honey batter is the most famous. Astonishingly, this improbable combination works and is very different from any fried chicken you may have had before. Oxtail and bone marrow add a twist to traditional fried rice, while truffle teriyaki sauce brings a luxurious note to the filet of beef. You may finish with the ginger bread pudding. Since this is a Japanese restaurant, we recommend opting for saké or Asian beers. 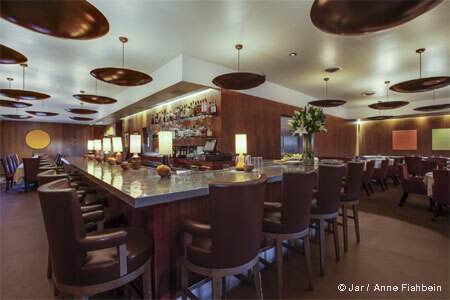 You will also find some wines and cocktails that you can enjoy at the back bar, which has more of a lounge feel. The venue is decorated in a modern Japanese style with warm tones of cedar and walnut woodwork.